Some of the most popular rowing machines for home and commercial use are under the name of Concept2. However, there are various other models under different, less known brands which are just as good, if not even better. One of them is the BodyCraft VR500 Pro. This is definitely a rowing machine made for commercial use, offering a wide array of features and functions. But one of its most important qualities, is that it combines air resistance with magnetic resistance, in order to deliver superior workout possibilities, but also a resistance “feel” similar to the rowing of a real boat. The frame of the VR500 Pro is made mostly of anodized aluminium, but also integrates steel and hard plastic elements. To be more specific, the gliding beam is made of aluminium, while its support legs are steel-made. The protective casing of the flywheel is made of heavy- duty plastic. The steel legs are powder coated with corrosion resistant paint (black), while the gliding beam features its natural (silver) finish, only having the logo engraved on it. The bases of the frame integrate small rubber stabilizers, in order to prevent any damage to the floor and add more stability to the machine. The front base also features small transport wheels, rendering the handling and relocation of the assembled machine much easier. When fully assembled, the rower is not exactly light, as it weighs approx. 101 lbs (45.5 kg), but leaning it on its front wheels, you will basically be handling less than half of its weight. The frame features a folding design. The aluminium rail folds up, and has a child safety lock. When folded, its length is reduced to 58.5″ (149 cm), while its height becomes approx. 77″ (195.5 cm). When unfolded, its footprint is rather large, especially length-wise as it takes 98.5″L x 20″W (250L x 51W cm) of floor space. Its highest point when unfolded is given by the flywheel case, which reaches approx. 38.5″ (98 cm). These being said, the machine is made for users up to 6’6″ (198 cm), or differently put, for users with an inseam up to 42″ (107 cm). Also, it can hold up to 350 lbs (159 kg) of user weight, which pretty much puts the machine in the commercial class. The seat equipped on the BodyCraft VR500 features a contoured surface, and a layer of padding which is not extremely thick, but provides the adequate comfort for prolonged rowing sessions, alleviating the impact on the coccyx bone and lower back. The rear of the seat also features a small lip, preventing you to slip backwards in case you gear is made of a less adherent fabric. The seat integrates a set of four wheels, with heavy-duty sealed ball bearings, offering a smooth glide. Also, an important aspect to mention here is that the gliding rail isn’t completely horizontal. It’s set at a slight angle, when the rower is unfolded and in workout position. This actually has a positive impact on the legs workout, as it adds a bit of difficulty for the catch phase, conversely rendering the recovery phase slightly easier. One last aspect regarding the seat that must be mentioned here, is its height. At its highest point, the top of the seat is approx. 19″ (48 cm) above floor level. In other words, it should be high enough to supply an easy mount / dismount even for users with impaired movement or other disabilities. The rower’s footrests are made of heavy-duty nylon material. They’re size adjustable, being able to accommodate sports shoes or feet of all sizes. They also incorporate adjustable straps to secure feet in place, accessories which can be very handy for users with disabilities for example. However, the footrests do not pivot. They’re fixed to the frame, at an angle of approx. 45°. 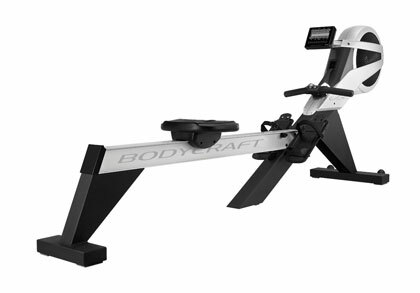 The resistance system of this BodyCraft rower combines air and eddy current resistance. Its main resistance elements are a magnetic flywheel fan, and a small servo motor. Now, since the flywheel is fan-shaped, the resistance is variable, proportional to how hard you pull. However, the overall level of resistance generated by the machine, can be increased via its eddy current system. And this eddy current system can actually offer up to 32 distinctive tension levels. Differently put, the resistance offered by this rowing machine is no joke. It’s a Pro rower, designed to supply the required training setting for professional athletes. The machine’s drive system consists mainly on a nylon strap, which wraps on a small spring drum. A small pulley is also attached on the axis of the spring drum, pulley that is connected to the flywheel fan via a poly “v” heavy-duty drive belt. The pulling strap is attached to an aluminium handlebar, coated with a thin layer of rubber foam for a comfortable grip. 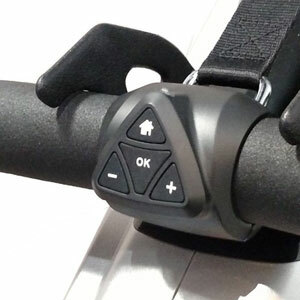 The handlebar integrates a small (wireless) remote control with keys that allow quick resistance adjustment, without the need to interrupt your workout. One last aspect to mention here regards the noise level produced by this machine. Compared with a rower with full air resistance such as the Concept2 models, the noise level of the BodyCraft VR500 is considerably lower. The fan does emit a “woosh” noise when it spins, but as a general idea, it’s far from being loud enough to cover the volume of your TV. The fitness computer supplied with the VR500 Pro rowing machine is quite an advanced one. First of all, it features a wide, easy to read display, with LED backlight and also backlit keys. It’s mounted on an adjustable arm with easy dual pivot points. The unit can track the following metrics: distance, time, strokes per minute, pulse, calories and watts. It also indicates the current resistance setting and the current profile. The distance is measured in meters. 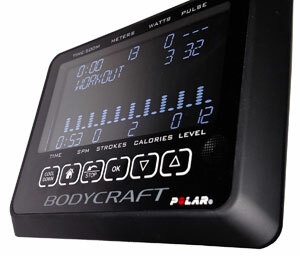 There are 12 workout programs preloaded in the console unit, including 4 Race, 4 HRC, 2 Interval, 1 Custom and 1 Manual. The HR control programs are for 55%, 75% and 90%, however there’s also a custom HR setting. The custom program allows you to create your own workout, inserting the limits that you desire. There are actually 4 user profiles, which allow you to save 4 distinctive settings, to quickly swap between workouts. The computer also allows you to select target goals for time, distance and watts. The console can read pulse via HR chest strap, but this accessory is not included with the machine. It’s compatible though, with any Polar HR strap transmitter, with a 5 kHz frequency. 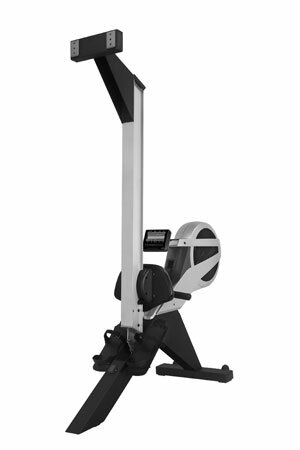 The rower requires to be connected to a power circuit in order for the console and resistance levels to become available. A power adapter is supplied with the machine, and connects to the frame on the front leg stabilizer. The console will start up when it detects movement on the seat, and will enter sleep mode after 4 minutes of inactivity on the rower. Some assembly is required for the VR500 BodyCraft rower. However, the console, the internal mechanisms of the machine come fully assembled and attached to the front part of the frame. The gliding part of the seat also comes already attached to the rail. Therefore, you will only have to attach the legs, bases, rail, footplates and seat, task that shouldn’t take longer than 45 minutes. The tools required are supplied, as well as a very comprehensive set of manuals for assembly and operation. Maintenance requires the periodic inspection of the machine’s joints and bolts. Also, the rail of the rower should be frequently wiped with a piece of cloth, in order to remove any sand, dirt or small objects that may damage the seat rollers or the rail itself. Price a bit higher than other similar rowers, but quality does match it. 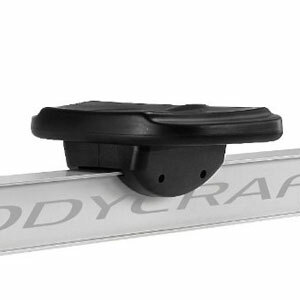 The BodyCraft VR500 Pro is a rowing machine designed for commercial or professional use. It can supply medium to high difficulty workouts, and comes with an advanced fitness meter. It’s a great machine for strength and stamina building, interval training, cross-training, but it’s also a perfect machine for anyone who wants to undergo a consistent cardio training daily, or at least several days per week. It features air and eddy current resistance, offering the natural rowing feel, but also the possibility to increase its overall resistance, to bolster the consistency of your workout. It has sturdy frame, with a folding design, which can be very handy especially if usage space is an issue. 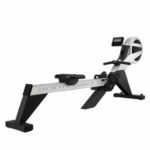 Finally, it’s not exactly a cheap rower, actually being a few $100s more expensive than the Concept2 Model D and E. However, quality and durability match its price.